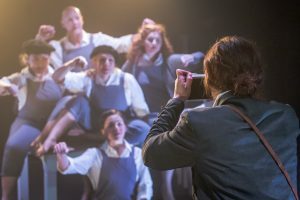 The acclaimed Female Firsts season at London’s Jack Studio Theatre last night premiered the second in a pair of new plays that give a snapshot into the lives of two remarkable women whose lives have largely passed us by. 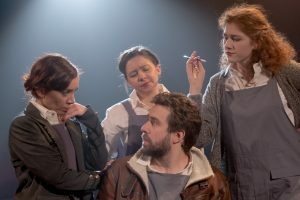 Gentleman Jack and Taro, both written by Ross McGregor, artistic director of Arrows & Traps Theatre Company, celebrate wildly different women but, at their heart, they share a common theme. I’ve worked with a number of photographers during my lengthy career as a journalist and they are, almost to a one, driven, single-minded and a little eccentric. They see life through a lens, in wide angles, the focus fixed firmly on the subject to the exclusion of everything else. You can count the number of famous female wartime snappers on one hand. They are a rarity even today, much less in the 1930s when Taro briefly shot to fame. 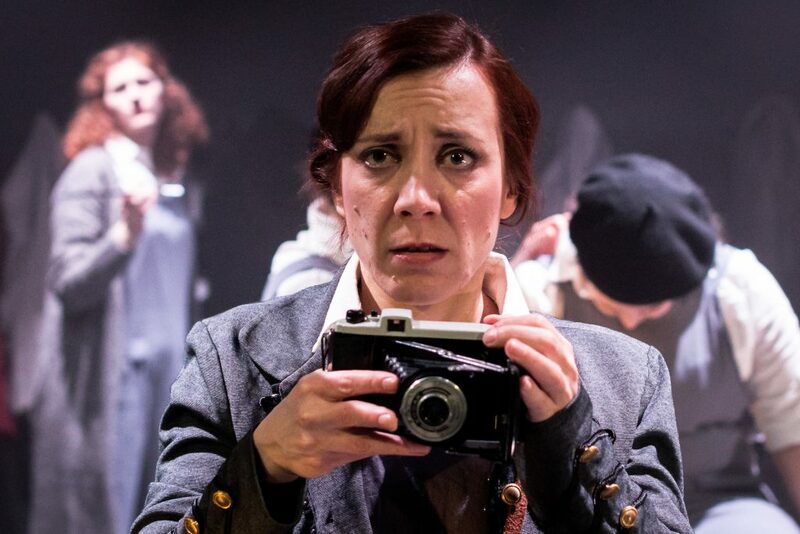 Gerta Pohorylle – or Gerda Taro as she became – is probably only known to those in the business yet hers is a fascinating tale which is ambitiously told. Jewish, German, fiercely independent and fearless, she left her home country during the rise of Nazism and based herself in Paris where she met Hungarian photographer Endre Friedmann (Tom Hartill). He began teaching her how to handle a camera and soon the pair were capturing unforgettable images of Europe at a time of terrible upheaval. But, more often than not, Gerta’s work was credited to Endre and both of them didn’t get the full recognition they deserved because they were Jewish. So the ambitious pair invented an alter ego, Robert Capa, a fictional, rich, renowned American combat photographer, and Europe was jolly lucky to have him, said Gerta. Gerta became Gerda Taro (Cornelia Baumann) and, slowly, the pair’s reputation for combat photography grew. They eventually ended up in the thick of the Spanish Civil War and the rest is history. McGregor’s elegantly drawn and poetic Taro occasionally wanders off into the abstract and surreal but it has flourishes of brilliance. McGregor, directing his own sweeping narrative, takes the audience from a restless and increasingly antisemitic Germany to the gaiety of Parisian cafe culture and into the hell of war, all shot without any Vaseline on the lens and with the aid of just a few benches. He gives Gerda her own Henry V moment, a real first for a woman on the front lines, delivering a rousing “St Crispin’s Day” battlefront speech to defeated Spanish resistance fighters. But the play really shoots from the hip with its portrait of the volatile relationship, both personal and professional, between Capa and Taro. In close-up Taro is a tempestuous story about passion, ambition and emancipation that holds your attention and even moves you to tears. Certainly one particular speech by Hartill’s Friedmann had women sobbing in the audience and, to be honest, I had a little lump in my throat too. But he does give a finely tuned performance that combines the devil-may-care bravado of a reckless adventurer with the veiled sensitivity of a man unable to admit his feelings for the exceptional woman at his side. Greta Garbo (Beatrice Vincent) and a young Gerta (Lucy Ioannou), their voices given a cold reverb, act both as a plot device and as narrators – not as bizarre as it sounds as, apparently, Gerta had worshipped the screen idol. 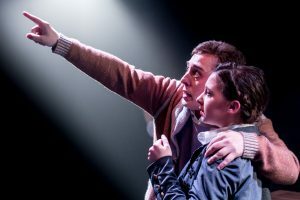 While Ioannou haunts the stage as storyteller it is up to Baumann to brilliantly flesh out the character of Taro, a woman who appears to be both courageous, impetuous and intrepid. Gutsy and bold, Taro is a play which deserves wider exposure. It’s a snappy production, running to about 100 tense minutes without an interval, that brings into sharp focus the sacrifice and bravery of one of the world’s foremost wartime photojournalists. Taro and Gentleman Jack run in rep at the Jack Studio Theatre, Brockley, until February 16. Taro deserves wider exposure. It’s a snappy production that brings into sharp focus the bravery of one of the world’s foremost wartime photojournalists.